Disclosure: Some of the links in this Bacon and Pimento Cheese Burger Rollup recipe post are affiliate links and I will receive a small commission if you click on one of those links and make a purchase but it comes at no expense to you. since my kids have smaller appetites, bite-sized meals allow me to feed them a full meal with very little waste or leftovers. I was recently visiting a fantastic Atlanta restaurant just outside the perimeter called Universal Joint. They are best known for their delicious burgers and I tried one called The Steinbeck. It is made with pimento cheese, bacon, and jalapenos and to say it was mouth water would be an understatement (seriously look at the picture below and tell me you're not drooling). Mine was served without the without the peppers, but if I could have handled the heat, I know they would have been the perfect accompaniment to this succulent burger. I left the restaurant, and for days I was dreaming about the burger. I decided to take matters into my own hands and try to remaster The Steinbeck into a family-friendly game day recipe, and thus the Bacon and Pimento Cheese Burger Rollup was born. On an ungreased cookie sheet spread out the pizza dough. Use a rolling pin or your hands to stretch the dough out as much as you can without creating holes; all the while, keeping the dough within the boundaries off the cookie sheet. In a hot skillet, brown the ground beef and drain. Return the meat to the skillet and add the burger seasoning, cook an additional 1-2 minutes over medium-low heat. Remove from heat and add the onions and jalapenos to the meat mixture, stir. I do not add peppers when I make this for the kids, but you can customize this to your family's tastes. Next, spread the pimento cheese evenly onto the pizza dough, leaving approximately 1/4 inch space along all the edges. Sprinkle the meat mixture and then the bacon evenly on top of the cheese. Carefully, roll up the dough in a jelly-roll style, starting with a long side. Pinch the seam to seal and tuck the ends under the rollup. Place the seam side down in the center of the baking sheet. With a sharp knife, cut four to five, 1/4-inch deep slits along the top of the loaf. Bake for 20-30 minutes or until golden brown. Cool slightly before slicing. Serve warm with ketchup and mustard for dipping. This recipe quickly became a family favorite and a game-day menu must. 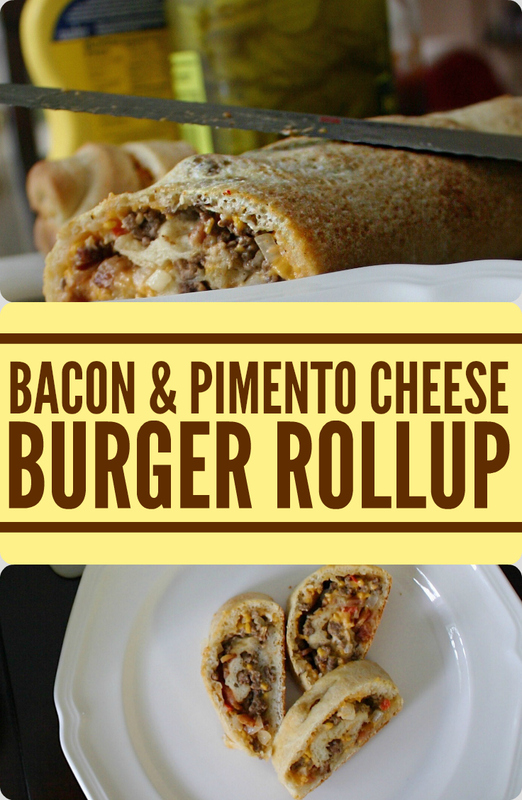 I've made it several times since football season kicked off and my kids are always asking for "burger rollup" for dinner. In fact, my oldest said he wanted this served for his birthday! As the weather gets colder, this is an easy, comforting meal option that is taste-bud and family friendly. It's not fancy, but it sure brings back all the taste sensations of that delicious burger I had at Universal Joint. Have you ever been so inspired by a restaurant meal you've tried to recreate it or remaster it at home? If so, I'd love to hear about your experience in the comments below. Also, don't forget to enter to win the free Smile Brilliant at-home Teeth Whitening Kit giveaway here.